Nine and a half miles. One thousand, five hundred and forty one feet of accumulated elevation gain. Hundreds of great photo opportunities, and a real sense of accomplishment. 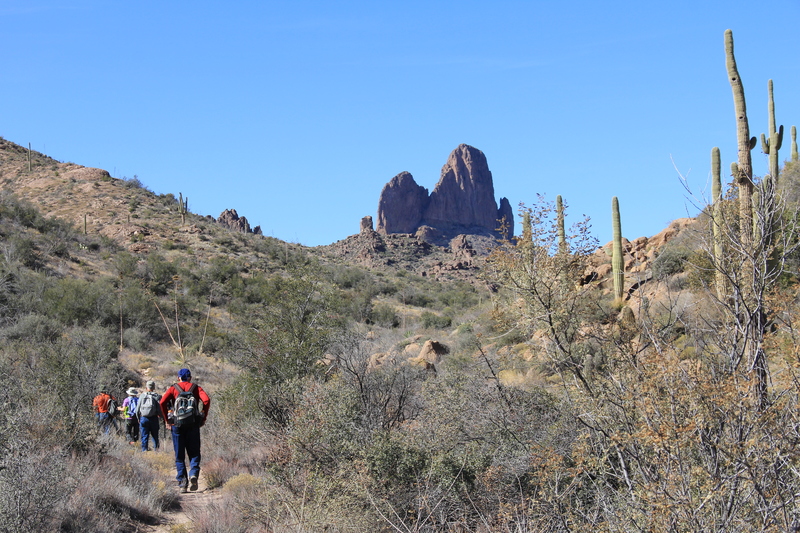 Today (Friday, 1/18/2013) the hike was the “Bluff Springs Loop” in the Superstitions. Yes as you see in the introduction above, it’s a little bit of an “ambitious” hike, but today was a perfect hiking day, temps in the 50’s at the morning trailhead and low 70’s later in the day. Like all loops, you can do this one either clockwise or counter-clockwise. For us “mature” codgers, this one works best counter-clockwise. 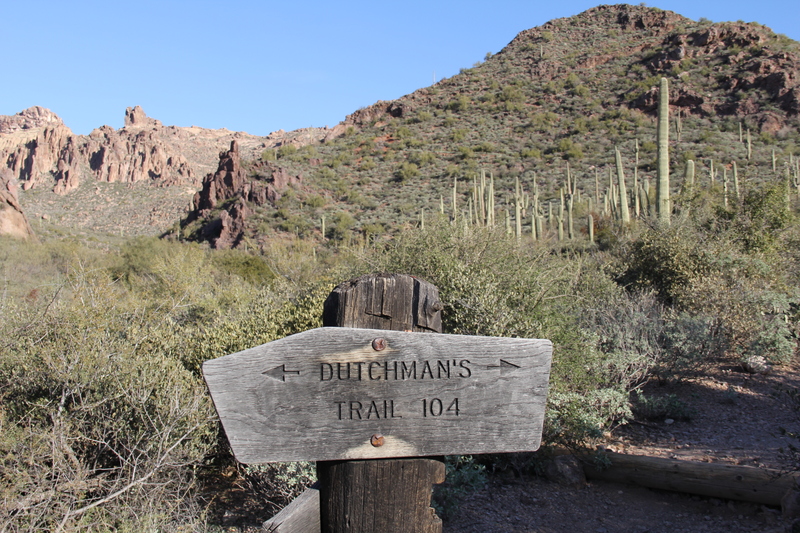 We left the Peralta trailhead on trail 104 (Dutchman). The first half mile or so is a little leg stretcher, as you climb over a small ridge maybe 300 feet tall, then descend into Barkley Basin. 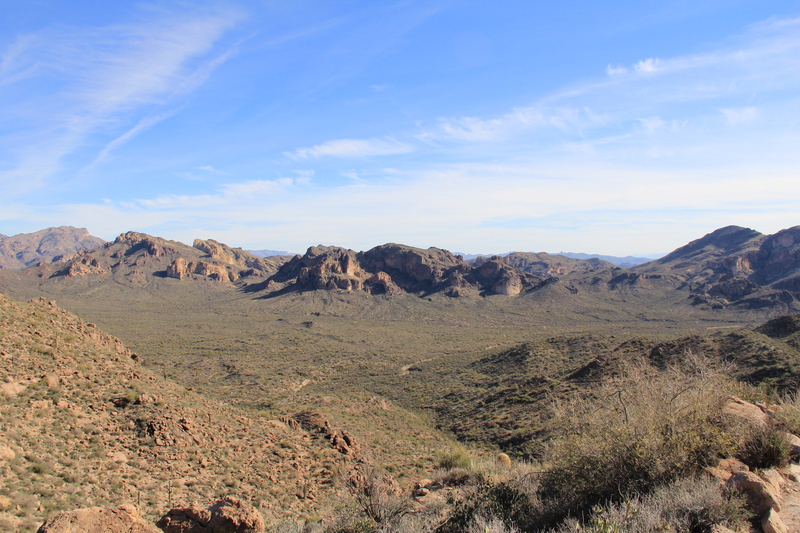 This a wide pleasant valley,extending for about 2.5 miles of mostly level hiking on the valley floor. 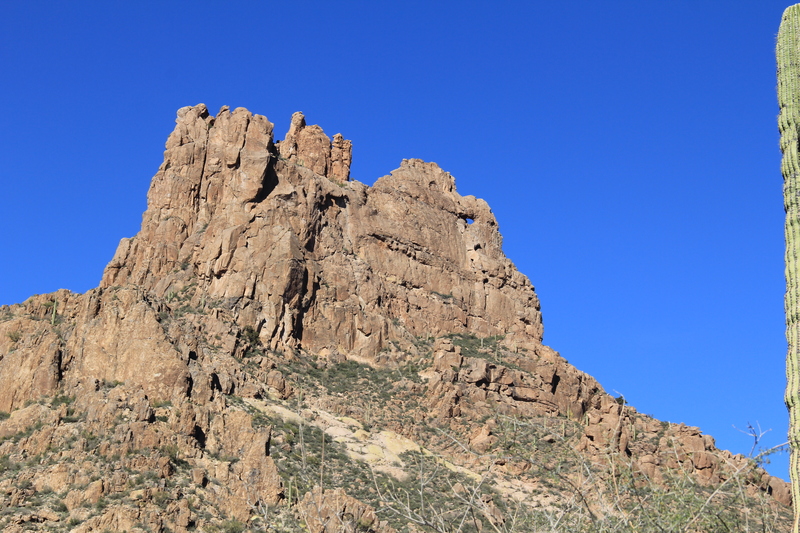 Your eye is constantly drawn to the front face of the Superstitions to your left, where the dominant formation is a volcanic plug called Miners Needle. 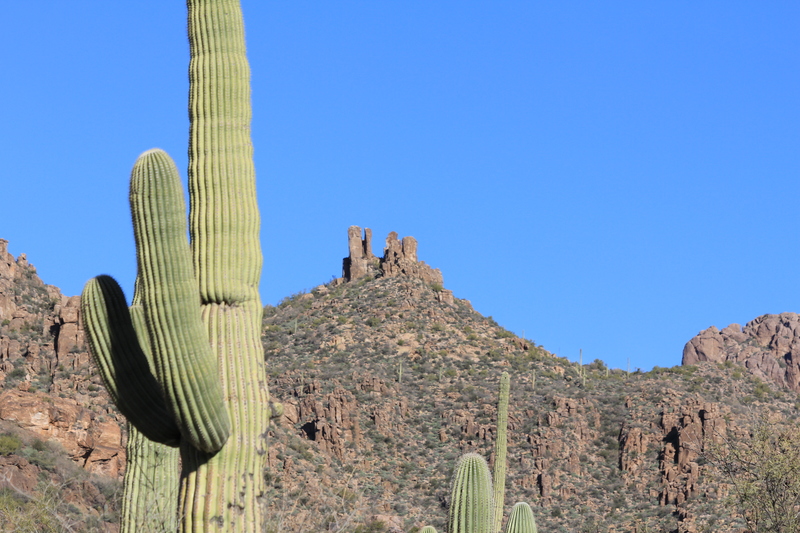 This formation (seen here in long lens shot) reminded me of some European castle, high on the ridgeline. 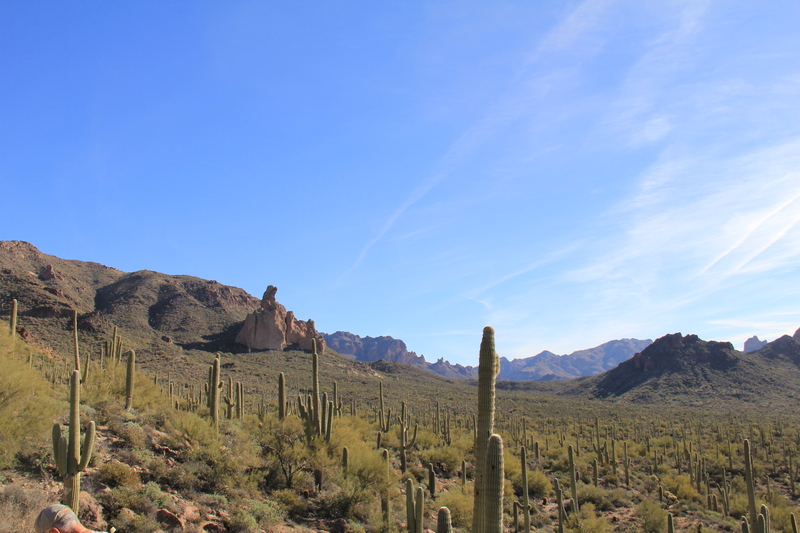 Straight ahead, some formations of the eastern Superstition range invite you to stay in the valley and explore further eastward. But those beckoning mountains are not on the agenda today. Soon you find yourself below Miners Needle (notice the “eye”), and it’s time to abandon the easy travel in the basin and head into the interior of the Supes. 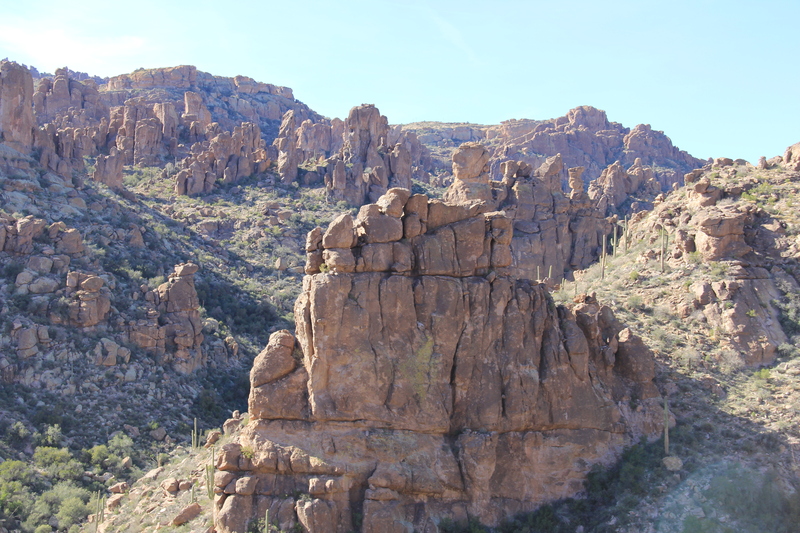 At the base of this formation is a junction with Coffee Flat trail continuing eastward, and Dutchmans trail turns north out of the basin. 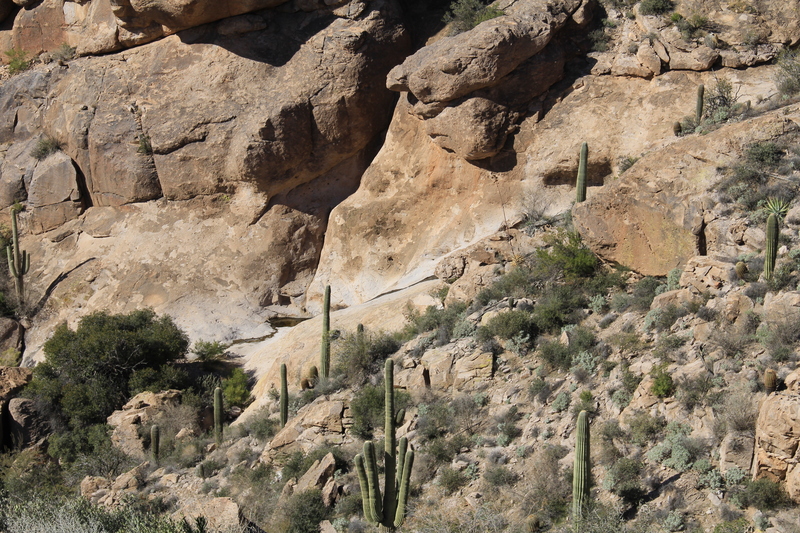 The next mile and a half sees you steadily climbing as you work your way around the “backside” of Miners needle. Not a tough ascent, but relentlessly steady. Stopping from time-to-time to rest, the views are worth the wear-and-tear on your legs. 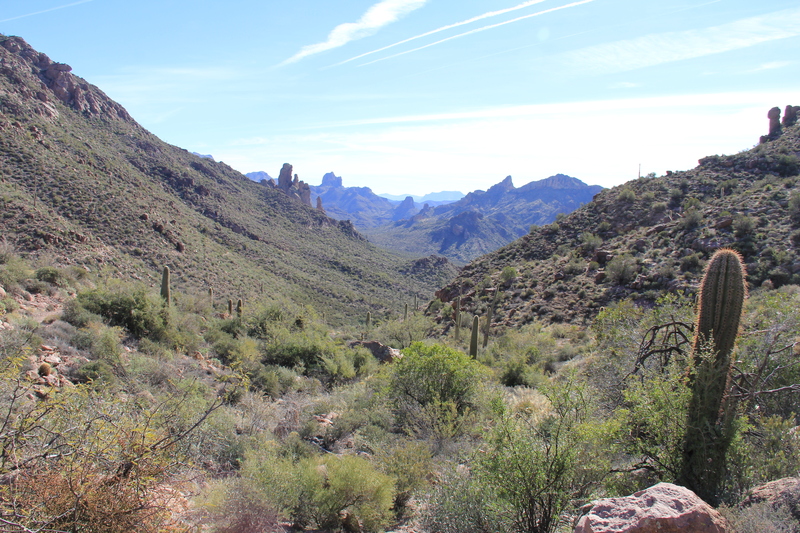 Here is a view of our backtrail looking southeastward. 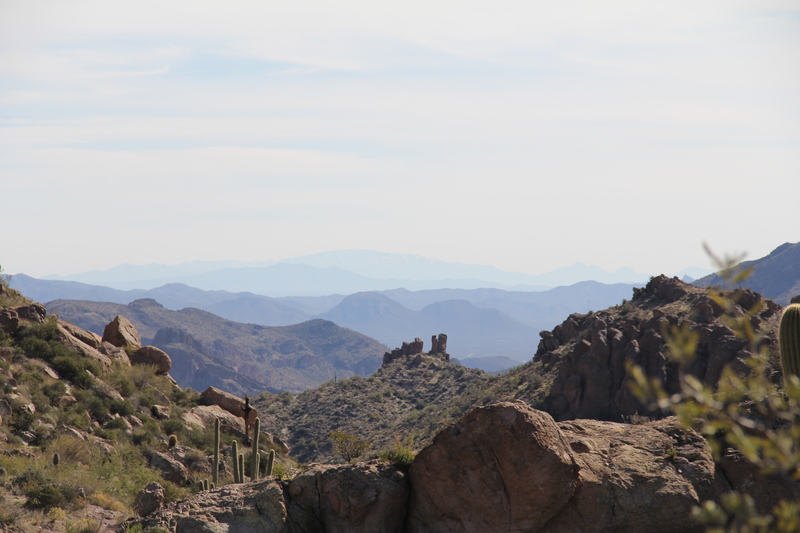 The distant hazy formation at photo center is PicketPost Mountain, thirty-some miles away. 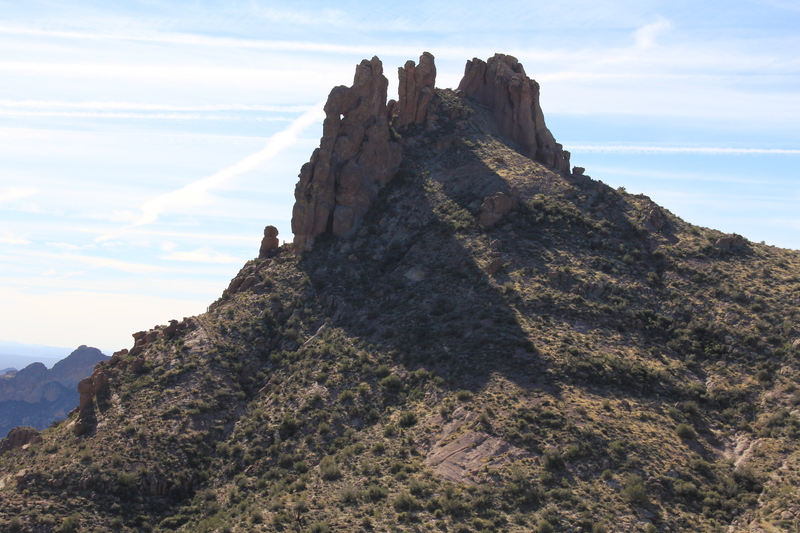 As you gain altitude, the “backside” of Miners Needle is revealed, and from here the “eye” doesn’t seem so high above you. At the crest of this climb at Miners Summit, a junction sign to another trail tempted some of the guys to take a side trip to fill their canteens, but we talked them into staying on route. From this summit, the trial again dropped slightly into a broad valley with easy hiking on an easy trail, a nice change from the rocky climb behind. 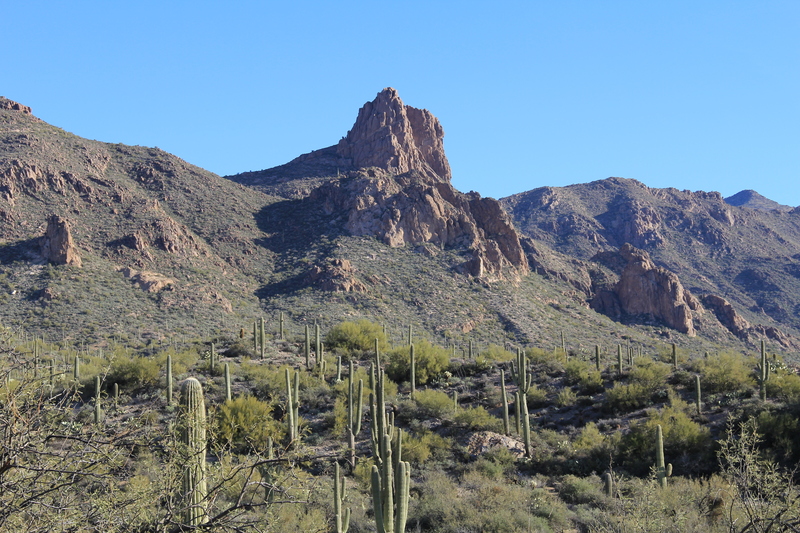 At his elevation the dominant plant is no longer the saguaro, but upland vegetation like mountain holly and pinion trees. 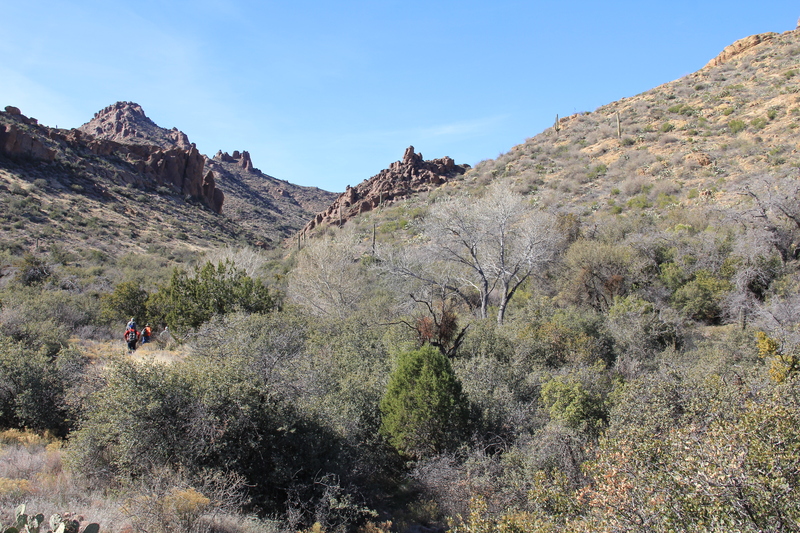 At the head of this valley Dutchmans trail veers to the north, heading for the First Water trailhead, and we take a left hand turn on Bluff Springs trail, heading southward back toward the Peralta trailhead. 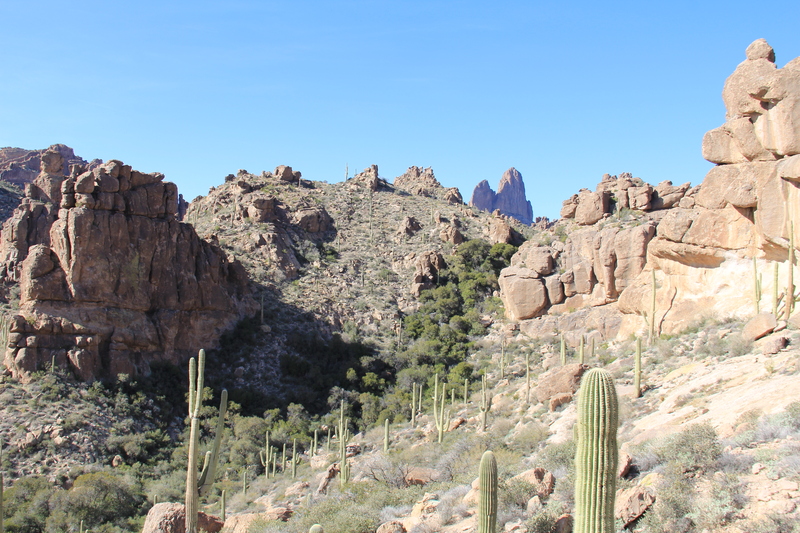 For about a half mile this trail slowly works it’s way up a rocky watercourse, giving some nice views of Weavers Needle to the west. Continuing to climb, the trail gets near the ridgeline giving long-horizon views again to eastward (center in the photo below is a reverse view of that “castle” seen earlier below from Barkley Basin), and views of the rugged country to the westward in “hoodoo” country. Eventually Bluff Spring trail again overlooks Barkley Basin, and after about a half mile negotiating our way down Cardiac Hill we are back at the parking lot. If you didn’t do this route with us today, put it on your list for the next run. 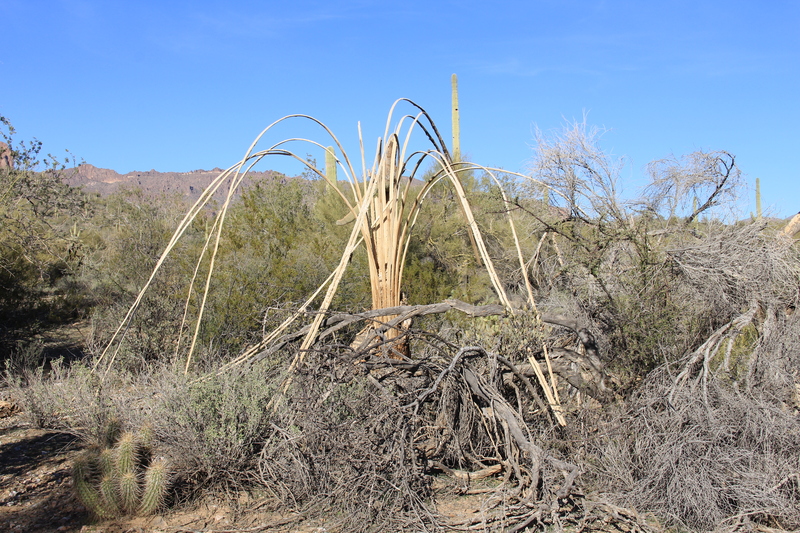 On the road out Nancy spotted this scene, the remaining ribs of an old saguaro. Thanks so much for sharing. Beautiful photos! Thanks Hans for a wonderful description of a hike I have not yet made. Great photos as well! 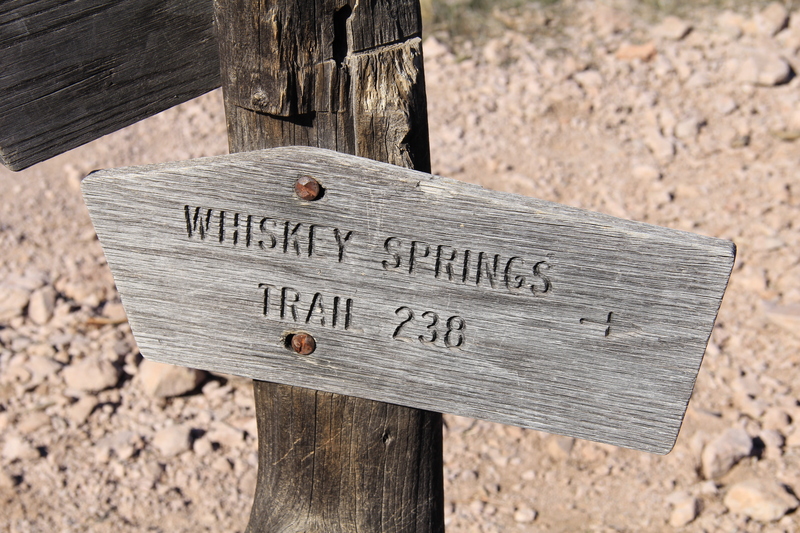 Hans, you’re in a good shape for doing this hike, take and comments the gorgeous photos! Always a delight to read your narrative and see you photos from one of the scheduled hikes. Makes me wish we’d taken the long hike. We had a great time with Bob on the in and out trek though.